The Blue Heron Large Horizontal Wall Mount Mailbox is a stunning mailbox made of solid brass - available in 6 finishes with 4 glass choices. The beautiful blue water glass shown is standard. A gorgeous addition the entry decor of any home or business. A piece of art glass is mounted behind the Blue Heron design to highlight it. 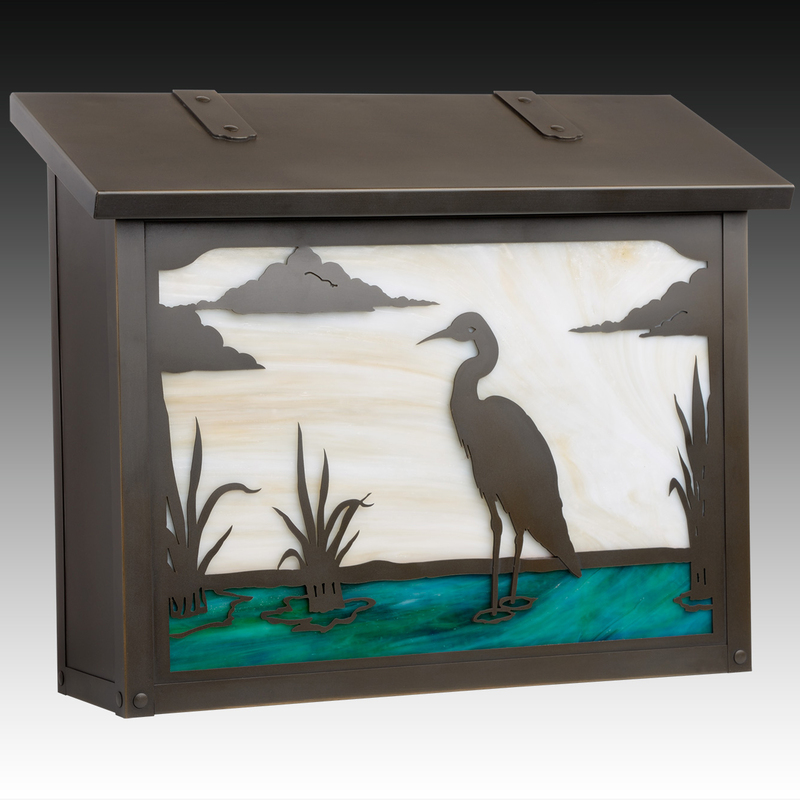 Our Blue Heron Large Horizontal Wall Mount Mailbox is handmade of solid brass - in the beautiful craftsman style - and has a traditional hinge detail on the lid and a rubber bumper inside to eliminate any noise when closing. The corner rivets complete the design and give this mailbox it's rugged handcrafted look. Easy to mount and a wonderful addition to your front entry - the Blue Heron Mailbox will be a delight for years to come. American Made. Mailbox is available in five beautiful colors: New Verde, Old Penny, Architectural Bronze, Warm Brass, and Textured Black. Dimensions:Width 16 1/2" X Height 13 1/4" X Depth 5 5/8"